This month's bookshelf points to the past year's most significant and authoritative climate change reports. Yale Climate Connections here highlights reports that incorporate 2017 data into the climate record, that update projections of climate’s impact on food security, public health, and the economy, and that lay out competing policy options for action, including the “Green New Deal” that hit the headlines in the wake of the 2018 election. The descriptions of the 12 reports listed below are drawn from copy provided by the organizations that released them. A link for the PDF version is included with each entry. 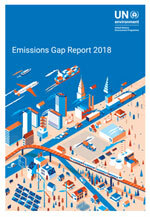 This year, the annual Emissions Gap Report includes an assessment of the emissions associated with the Nationally Determined Contributions, which form the foundation of the Paris Agreement, and the current policies of each of the G20 members, including the European Union. The report features new information on the “emissions gap”, which is the gap between where we are likely to be and where we need to be. 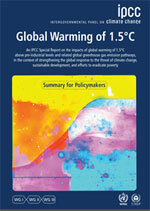 It takes into account the latest scientific information, including the IPCC Special Report on 1.5°C. The report also features ways to bridge the still existing emissions gap, including fiscal policy, the role of innovation, the role of non-state and subnational action and ways to increase the ambition of Nationally Determined Contributions. For a related analysis, see World Resources Institute’s Toward Paris Alignment. 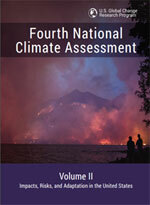 Volume II of the Fourth National Climate Assessment (NCA4) analyzes the impacts and risks of global change, as described in Volume I (Climate Science Special Report), and considers how different regions of the United States might adapt. As overseen by a Federal Steering Committee comprising representatives from USGCRP agencies and NOAA, the administrative agency responsible for establishing procedures, the report has undergone an extensive, multi-phase process of internal and external review from Federal agency experts, the general public, and a panel of experts from the National Academies of Sciences, Engineering, and Medicine. 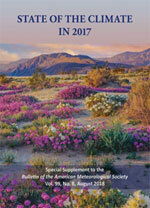 An international, peer-reviewed publication released each summer, the State of the Climate is the authoritative annual summary of the global climate published as a supplement to the Bulletin of the American Meteorological Society. The report, compiled by NOAA’s Center for Weather and Climate at the National Centers for Environmental Information, is based on contributions from scientists from around the world. It provides a detailed update on global climate indicators, notable weather events, and other data collected by environmental monitoring stations and instruments located on land, water, ice, and in space. This 28th issuance also documents the status and trajectory of our capacity and commitment to observe the climate system. The U.S. Northern Plains and East Africa droughts of 2017, floods in South America, China and Bangladesh, and heatwaves in China and the Mediterranean were all made more likely by human-caused climate change, according to new research published in this supplement to the Bulletin of the American Meteorological Society (BAMS). 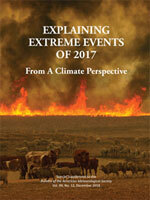 The seventh edition of Explaining Extreme Events in 2017 from a Climate Perspective also includes analyses of ocean heat events, including intense marine heatwaves in the Tasman Sea off Australia in 2017 and 2018. This is the second year that scientists have identified extreme weather events that they said could not have happened without warming of the climate through human-induced climate change. Every year, WMO issues a Statement on the State of the Global Climate based on data provided by National Meteorological and Hydrological Services (NMHSs) and other national and international organizations. For more than 20 years, these reports have been published in the six official languages of the United Nations to inform governments, international agencies, other WMO partners and the general public about the global climate and significant weather and climate trends. The Provisional Statement on the State of the Global Climate in 2017 was completed and communicated at a press conference held at the United Nations Palais des Nations in Geneva in November 2017. This final draft of the statement was published in March 2018. 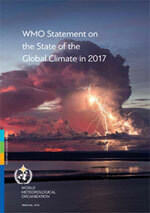 Reports on the state of the climate in 2018 will be released in March (WMO) and July (AMS). AMS will release its analysis of extreme events in 2018 in December. 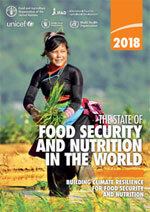 New evidence in 2018 confirms a rise in world hunger: the number of people who suffer from hunger has been growing over the past three years, returning to levels from almost a decade ago. Multiple forms of malnutrition are evident in many countries: adult obesity is growing even as forms of undernutrition persist. The report says that climate variability and extremes are key drivers behind this rise, together with conflict and economic downturns, and are threatening to erode and reverse gains made in ending hunger and malnutrition. The 2018 report reveals new challenges on the road to Zero Hunger, while setting out urgent actions needed to achieve the goal by 2030—in the context of the United Nation’s 2030 Agenda for Sustainable Development. For a related analysis, see World Resources Institute’s Creating a Sustainable Food Future. The President of the 23rd Conference of the Parties to the UNFCCC (COP23), Prime Minister Bainimarama of Fiji, asked the World Health Organization (WHO) to prepare a report on health and climate change, to be delivered at COP24 in Katowice, Poland. 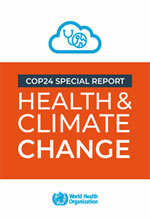 The report aims to provide (1) global knowledge on the interconnection between climate change and health, (2) an overview of the initiatives and tools with which the national, regional and global public health community is supporting and scaling up actions to implement the Paris Agreement for a healthier, more sustainable society, and (3) recommendations for UNFCCC negotiators and policy-makers on maximizing the health benefits of tackling climate change and avoiding the worst health impacts. For a related analysis, see Lancet’s 2018 Countdown on Health and Climate Change. 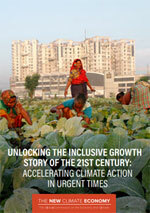 The growth story of the 21st century can unlock unprecedented opportunities of a strong, sustainable, inclusive economy. Research synthesized by the Global Commission on the Economy and Climate finds that bold climate action could deliver at least $26 trillion in economic benefits through 2030. This ground-breaking research produced by more than 200 experts highlights proof points of the global shift to a low-carbon economy and identifies ways to accelerate action in five sectors: energy, cities, food and land use, water, and industry. The benefits of climate action are greater than ever before, while the costs of inaction continue to mount. It is time for a decisive shift to a new climate economy. The Energy, Economic, and Environmental Implications of a Federal U.S. 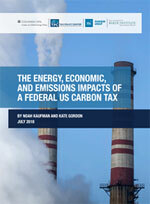 Carbon Tax, by Noah Kaufman and Kate Gordon (Columbia Center on Global Energy Policy 2018, 13 pages, free PDF available for download. 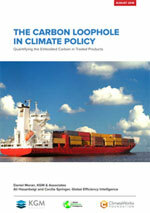 This brief summarizes three larger reports issued by separate collaborations between Center on Global Energy Policy (CGEP), the Rhodium Group, the Urban-Brookings Tax Policy Center (TPC), and Rice University’s Baker Institute for Public Policy: (1) Energy and Environmental Implications of a Carbon Tax in the United States (68 pages – download), (2) Distributional Implications of a Carbon Tax (42 pages – download), and (3) The Effects of Carbon Tax Policies on the U.S. Economy and the Welfare of Households (55 pages – download). The same groups subsequently issued a report on the carbon tax proposed by now former congressman Carlos Curbelo. CGEP does not advocate for a particular policy but rather aims to produce clear, objective, and data-driven research that enables the thoughtful consideration of federal carbon tax policy in the United States. The popularity of progressive policies has been rising steadily since the 2016 presidential election. Mounting concern over economic inequality, injustice, and the threats of climate change are leading an increasing number of progressive candidates to call for more dramatic action. They propose an equitable transition to a 21st century economy and a clean energy revolution that guarantees clean air and water, modernizes national infrastructure, and creates high-quality jobs. 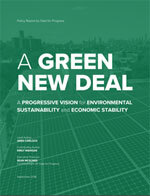 These proposals form the basis of A Green New Deal: A Progressive Vision for Environmental Sustainability and Economic Stability.